Animal Humane works with many local businesses to create mutually beneficial partnership that assist in saving even more homeless pets in New Mexico, and we’d love to work with your company for one of many opportunities. Businesses that partner with our organization gain increased visibility while aligning themselves with a well-respected and award winning nonprofit. As New Mexico’s leading animal welfare organization, our events are recognizable in our community and extremely well-attended. If your business would like to be associated with one of Animal Humane’s annual or one-time events, please contact our Partnership Relations & Event Manager for sponsorship or vendor details. What kinds of partnerships does Animal Humane offer? Animal Humane can partner with your business in several ways, with a goal of providing visibility to your business and revenue, pet adoptions or exposure for Animal Humane New Mexico. We strive for mutually beneficial relationships that are philanthropic, but also provide recognition to our partners through our promotional outlets. In this type of partnership, your business selects a specified time frame (a day, a week, a month, etc. ), a specific event or a promotion you are hosting, and directs a portion of proceeds and/or sales to Animal Humane. Each year, Animal Humane hosts highly publicized and well-attended events, like our Doggie Dash & Dawdle, New Mexico Humane Conference and Feline Film Festival. Each of these events includes significant reach to our constituents through advertising and other forms of recognition. Our Mobile Adoptions Team regularly visits businesses in the Albuquerque metro area. For adoption events, “Moby,” our large mobile adoptions vehicle, will visit your business or event location equipped with everything needed to facilitate dog or cat adoptions on your site. These events can be combined with Benefit Events for a highly successful partnership. On Doggie Dates, 2 – 3 adoptable dogs will visit your business, and provide information on our programs, services and events. These pets will be accompanied by members of our Adoptions Team and/or volunteers. During your event, members of the public visit our booth to speak with our representatives and learn more about the programs and services we provide. 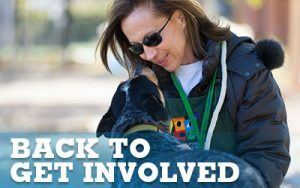 Outreach events can include the attendance of some of our adoptable dogs on Doggie Dates, but adoptions are not able to be completed at these events. We are always looking for creative new ways to work together! Perhaps your company can incorporate Animal Humane into your advertising or sponsor a media segment. Perhaps you might be able to co-brand an item to give to our 4,000+ adopters each year. Or, perhaps your company can help us supply food to our Pet Food Bank clients, or is interested in a naming opportunity.